One promising technique for reducing social anxiety is the use of animal-assisted interventions (AAIs). These interventions incorporate trained therapy animals to achieve specific treatment goals. Emerging evidence suggests animal contact might be used to reduce anxiety, but little is known about which specific aspects of human-animal interaction (e.g., social, physical) produce therapeutic benefits. In addition, there is little research testing whether AAIs reduce anxiety specifically in adolescents with social anxiety. 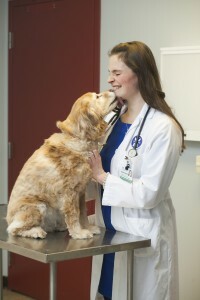 Dr. Mueller’s lab is currently conducting a research study funded by the Eunice Kennedy Shriver National Institute of Child Health and Human Development (NIH/NICHD), to explore the specific processes by which interacting with a therapy dog may reduce anxiety, and to test whether such an interaction reduces anxiety in adolescents with varying levels of social anxiety. TIHAI has participated in collaborative research with the Tufts University Center for Reading and Language Research. Families enrolled in the Tufts Summer Reading Program were invited to participate in an animal-assisted intervention research study this recent summer of 2017. 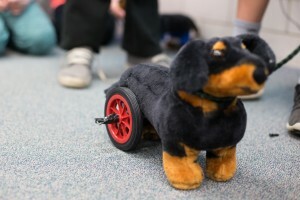 As part of their daily read aloud time, children in the study were either reading aloud solo or to a Pet Partner®, a registered therapy dog and handler team that has undergone rigorous training and evaluation to ensure health and safety for all involved. 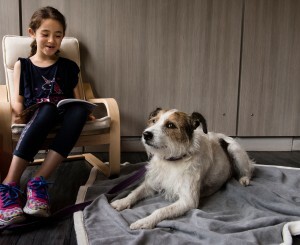 During their readaloud, data was collected on the children’s stress levels, feelings about reading and reading behavior to determine the impact of reading to dogs. TIHAI engages in ongoing outreach and research in animal-based science and engineering education through the Cummings School of Veterinary Medicine in collaboration with the Center for Engineering Education and Outreach. 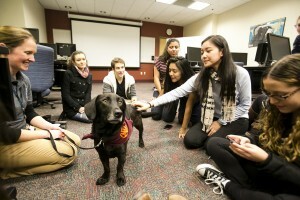 Our programs use animal-based content to provide a unique opportunity to leverage students’ affinity for animals to introduce core science and engineering principles. Animal-based content provides an excellent context for integrating science and engineering principles, thereby allowing students to learn key tenets from both fields simultaneously. The cross-disciplinary nature of this type of student exploration prompts connections across science domains and provides exposure to diverse career options within science and engineering fields. See our Publications page for more information about our research on this topic. One of TIHAI’s core areas of scholarship is the assessment and development of policies that promote safety and effectiveness in animal-assisted interventions. 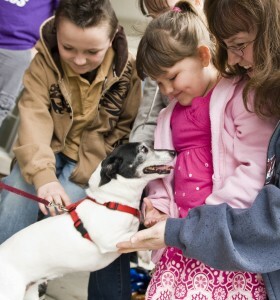 To view our how-to guide for facilities wishing to develop therapy animal programs, click here. Human-animal interaction can provide the opportunity for responsibility, the development of social skills and empathy, and positive community relationships. Understanding how HAI may be part of a broader developmental context that promotes positive outcomes for diverse children and adolescence is a key area of scholarship for TIHAI. Through high quality research, TIHAI seeks to understand the relationship between HAI and positive development in youth of all ages.